Pranayama is the art of conscious, controlled breathing – it is controlling your breath to alter your current state. When you slow your breath, you slow your thoughts, balance your emotions and settle the mind. Pranayama is a beautiful practice to help you become less emotionally reactive and more aware and present. How does pranayama affect our body and emotions? Pranayama has a wonderful affect on our autonomic nervous system which controls our heartbeat, respiration, digestion and more. The autonomic nervous system contains two parts: the sympathetic nervous system (SNS) and the parasympathetic nervous system (PNS). These systems are responsible for our flight-or-fight response as well as our resting response. Pranayama helps keep these systems balanced. 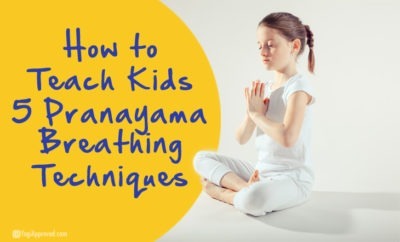 How do we begin a pranayama practice? Each day, commit to at least a few minutes of a pranayama practice. Start small and stay positive. Pranayama teaches you to become present and aware of what is going on mentally and emotionally. When you feel your emotions are out of check, remind yourself to stop and breathe. Nothing too technical at first – just learn to notice what is happening in your body and how your breath can help. Do you breathe through your nose or your mouth? When you inhale, do you fill up your chest or your belly? When you exhale, do you relax or remain tense? If you discover you breathe through your mouth, try to switch to nostril breathing. It will help calm your body and regulate oxygen flow. If you find you breathe into your chest, try to focus on deep belly breathing. Breathing only into the chest is called ‘upside down breathing’ and can actually create or increase anxiety. When you exhale, be more aware of your body’s response. Give your body the opportunity to let go of tension through the breath. Now that we know our breathing patterns, let’s become more aware of our breath and how it relates to stress. Stress causes our body to become tense, and our breathing to be short. The more this pattern continues, the more the body panics. If we can utilize pranayama to allow our breathing to remain normal, the more equipped we will be to handle stress. You have more control over your emotions and reactions than you may have thought. Pranayama can give you the power to become free; a person or event can no longer keep you anxious or stressed. 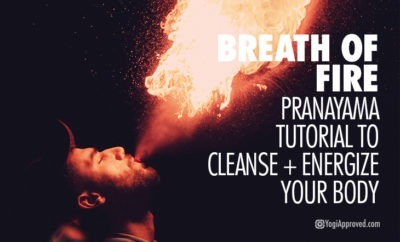 An easy pranayama technique with big results is called ‘positive breathing,’ and I practice this daily. Just a few minutes of positive breathing a day can completely change your outlook. Our thoughts greatly impact our attitude and viewpoints, so setting aside just a few minutes to invite positivity into your life will greatly change your entire perspective. 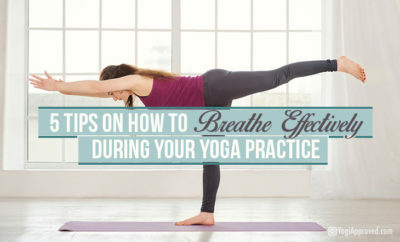 This technique is also called right nostril breathing and it is a fantastic pranayama practice to move energy through the body, reduce stress and revitalize the body. It will help you find a positive state of mind and improve your mood. Alternate nostril breathing helps to balance the left and right sides of the brain which also balances discipline and intuition. It is a great pranayama practice to clear your energetic channels, reduce stress and improve focus. Practice this conscious breathing technique when you are feeling stressed or nervous (especially about an upcoming event) to help find balance and clarity. If you are interested in learning more about this form of pranayama, check out this article on Alternate Nostril Breathing. Bhramari pranayama is one of my favorites because it cuts off sight and sound and invites your consciousness to completely internalize. This practice is also great to reduce frustration and anger, and calm the nerves. Bhramari pranayama also stimulates the pineal gland deep within your brain. The pineal gland is largely dormant and is mystically known as your sixth sense, but can be revitalized with regular practice of this breathing technique. Sitting in silence and focusing on breathing can be more challenging than it sounds. Pranayama is a practice, and the more you do it the easier it will become. Pranayama is available to you at anytime. It will help you let go of negative thoughts, and begin to balance your mind and emotions. Everything you need is already within you, now is the time to access it. Has this article helped you better understand pranayama? Do you have any questions about any of the techniques we’ve discussed here? Feel free to ask in the comments below – we love hearing from you! Dawn Yager, affectionately known as Swami (ordained in 2012 in the Kriya yoga lineage), has been teaching for over 16 years. Dawn teaches at her own studio in Myrtle beach while traveling the east coast to teach workshops. She also helps to run a domestic abuse shelter for women and children in the suburbs of Detroit.